I have been lying to all of you. Well, not lying really, but…holding back the full truth. In a previous post I exalted about the Cross House being awarded a $90,000 Kansas Heritage Grant. But…but…in the fine print of the grant, page 476, subsection Q, line 48, there was a clause. The clause stated that even if awarded a grant, no monies would be distributed until after the Kansas legislature approved the state budget in early 2015. The grant is funded by a small tax collected on every mortgage filed in Kansas. This money piles up in an account (about $830,000 last year), and then is distributed to historic properties across the state. I cannot think of a better use of tax dollars, and hundreds of historic structures have been restored with help from the Heritage Fund. Every state in the union should have such a program. However, even though the collected funds are specific for the above purpose, the funds cannot be disbursed until the state budget is approved. And the Kansas legislature could seize the Heritage funds. We were told not to worry much about this clause because, in all the decades the Heritage Grant has been in existence, the funds were approved for disbursement. But, to anybody paying attention to the Kansas budget of late, all hell broke loose this year. When we received approval on February 15, we were told that we would know in a few weeks about the money being approved for disbursement. So me and thirteen other recipients just had to wait a bit before commencing with roofing, new gutters, foundation issues, leaky windows, missing siding, and termites. February ended and we were told to wait just a bit longer. Then we were told to wait a bit longer. I was planning a party to celebrate the grant, and so scheduled it for May 1, because surely we would have confirmation by then. Surely. But we did not. I could not push the party back, so went ahead. While my guests seemed to have a grand time, I did not. I felt like fraud, for I knew the grant might not happen. As the harpist played, as splendid hors d’oeuvres were passed around, and as wine was consumed, I wandered around with a sick feeling in my stomach the whole time. Then another week passed. And no word. Then another week. Then another. The Kansas legislature is supposed to confirm the budget within 90 days as required by law. But 90 days passed…and still no approval. This is unprecedented. “Next year will be my 40th year in the Legislature, and I have never seen a session like this one,” stated Anthony Hensley (D). Last year I wrote a post about improving my diet. After writing the post I lost an amazing 17 pounds. However, the stress of the last months has caused me to add half of the lost weight back on. That is how I react to stress. COMFORT FOOD! And COMFORT DRINK! After the party on May 1, not much has been going on at the Cross House. I have been paying down the titanic-sized invoice to have the radiator system fully restored to working order, and until that bill is paid I cannot be hiring out any new work. So, I have been working on the house alone, and mostly on the library. It is now painted, and I have built walls and walls of shelving, and miraculously moved thousands of books into the house (no easy feat for a fifty-eight-year-old). I should be feeling joy over progress on the library, but with each passing week and Still No News, my anxiety level has increased to extraordinary levels, suppressing all other emotions. After reading online about the legislators trying to find every penny to close the massive budget deficit, I grew highly pessimistic about ever receiving a penny of Heritage funds. With this awareness, I began walking around the Cross House, and gently touching its walls, caressing trim, resting against its many mantles, and…feeling a deep pain that I had betrayed the house. I’m sorry, I kept whispering to the house as I touched it, I’m sorry. If the funds did not come through, there is NO WAY I could do much of anything about the roof and built-in gutters which are causing terrifying havoc (a $32,000 scope of work). And there is NO WAY I could begin the restoration of the 40 stained-glass windows (about $47,000). And there is NO WAY I could do the other projects (like replacing the sill of the house) without the grant. I could have done these projects last year when I had a construction loan, but spent the loan on other things, knowing that the roof and gutters and stained-glass windows and sill stood a good chance of being funded by the Heritage Grant. And this is why I have been apologizing to the house of late. All that I did with the construction loan was vital. But had I known there would be no Heritage Grant, I would have first fixed the roof and gutters and stained-glass and the sill. But now? I do not have the money for these important projects. Each time it rained this year I felt a kick in my stomach, for each deluge brings new damage to my beloved house, and with each passing month I have despaired of being able to do anything about this. I have also felt bad for the people who administer the grant. This is something they deeply believe in. I had the sense that they, too, must be reeling. As well as the thirteen other recipients. All reeling, across the entire state. Today, Mi’Chielle came by my office. Mi’Chielle did most of the work on the grant, and without her help it could never have happened. So, she, too, has been reeling. As she stepped into my office, we sat down. Just then I saw that an email had come in. I stared at the email, my eyes wide, with my heart in what must have been a dead stop, and with time suspended. It read: The grant funds can now be disbursed. Mi’Chielle beamed, and replied: “Yes. YES!” I gave her a big hug. Tomorrow I will be at my beloved house. I am going to give it a big big big hug. And a kiss. What can I say Ross except THREE CHEERS for the house and for you !!!! That is fantastic news! So glad that all of your and MiChielle’s hard work and dreams will be realized! Glad it came through! I can imagine how stressed you’ve been all this time. Time for another party then? Maybe another party AFTER the grant has been spent and all the work completed! Yayayay!!!! You had me panicking for a minute! So happy for you (and your beloved)! I know the feeling! I have been panicking for months! I agree Merryl! RATFINK! Haha! I haven’t heard that word in decades. My t-shirt size is Small and Ross, YOU are buying! Plus like, delponders, I was thinking of ideas for fundraisers. The X-rated headline I told you about was for a post if I did NOT get the grant! So, I am most certainly NOT a double ratfink! So it’s funny how I happened on your restoration of this house. I grew up in Emporia, age 5 to 20, until I moved back to my beloved birthplace of Texas. I’m now 40. Well one night I was telling my husband about the Pastor and mistress murders. So I looked up the story to see where it was as far as their prison sentences. Well, in googling Emporia stuff I ran across your blog. I could not believe it. My whole life in Emporia I had a love affair with that house! When I was 18 I moved into my first house one street behind Union. I’d frequently walk over to the Cross House and admire it and try and look in the windows so I could see what the interior was like. I had always been so scared they would eventually tear it down. In coming to Emporia to visit my sister and mom I did see years ago that someone had bought it and was fixing it up. My sister would keep me uodated, as she knew that house was my dream house. The night I ran actoss your blog last week I literally was up all night, didn’t sleep at all, reading every entry and gazing on every picture. Now I see what you are doing and I’m so thrilled. First, it’s looking lovely! Second, I love that you are keeping all the wonderful old features. It’s my dream to own an old house like that one day. I have one question. I’ve always wondered…of course…growing up and seeing in the dilapidated state it was always in, if there were any lingering spirits about in that wonderful old home? 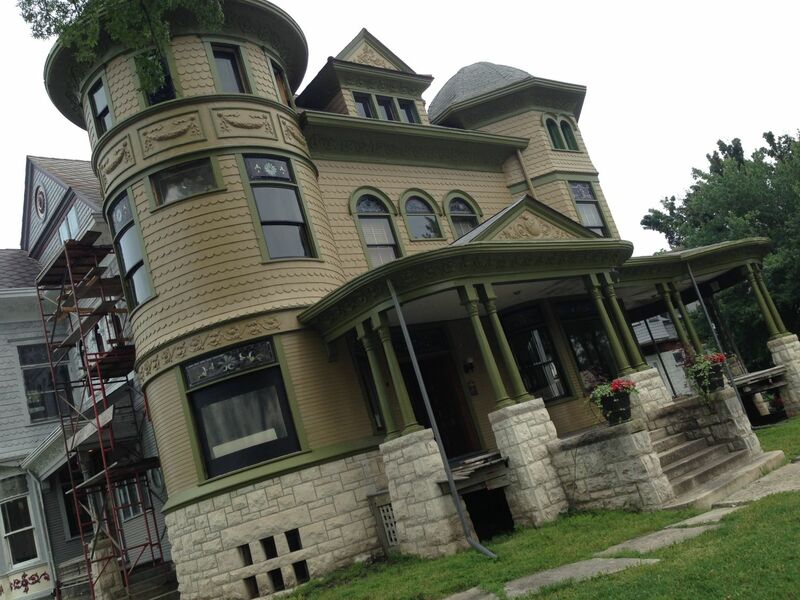 Thank you for restoring that wonderful old home and making a dream of mine come true…seeing it in all its glory again. Sorry for the type-o’s….lol…i promise I’m not an idiot. Typing that much on a phone screen I didn’t catch the mistakes. Thank you. Lol. So I’m dying for an answer to my post. Don’t leave me in suspense. I do not sense any spirits in the house. Sorry! Oh good grief. Get your sh*t together, Kansas! There are old houses that need help! You poor thing. I would have been a mess. I hope not too much damage has been done to your lovely house. If so, send the bill to the legislature! Ross, you are my mentor and inspiration and hero! I’m so relieved that the grant money is coming your way. Signed, a fellow owner of a beloved, dilapidated, heritage-designated fixer-upper – this one on the west coast of Canada. Ahahaha. Ross: You’ve learned how to build suspense like Alfred Hitchcock — you had us all panicking. So happy there is a happy ending. Now that you really have the money, I think you should have another party! So pleased! Good fortune could not shine on a more deserving project or a more fabulous friend! My eyes welled AFTER I read that your grant $ came through… Tears of happiness for you and your beloved Cross House! Reading your blog has been inspirational to many of us; your writing style is quite captivating! My best wishes and thoughts are with you, Ross… I’m “all in”! Where can I send my order for the Ratfink Ross tee shirt? I would proudly support! And how come you haven’t added a PayPal link so we can help you out? I lost my old house but all of your faithful followers would kick in a few bucks for a cause as good as this. PS – I tried emailing your contact page but it won’t take the message. I now have a help link.